United States, late 2oth century In this whimsical armchair a rounded cushioned puff of a seat floats above a chrome pedestal and swivels 360 degrees. Three chairs are available. USA, 1970s This sofa is by Milo Baughman and features blue velvet upholstery and a wide polished chrome frame. 1970s From a design by Anton Lorenz, these Thonet armchairs set deeply contoured barrel-back seats within tubular chrome cantilevered frames. United States, 1970s This striking dining table from the 1970s features a beautiful olive burl top and Art Deco–inspired chrome skyscraper legs. Two 18-inch leaves allow the table to extend up to 98 inches. Italy, 1970s These striking dining chairs feature chrome frames, vinyl seats, and lucite and plastic backs. USA, 1970s Designed in the style of Milo Baughman’s work for the Pace Collection, this set of four chairs from the 1970s features a double curved chrome frame with a cantilevered seat upholstered in beige vinyl. United States, 1970s Styled after Milo Baughman, this 1970s club chair sets a gently curved upholstered seat into a sharply geometric frame in polished chrome. 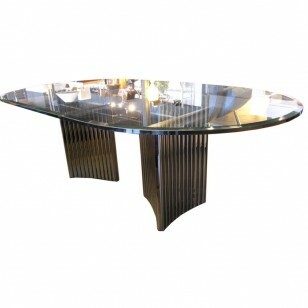 Italy, 1970s This glass-top dining table features a pedestal base comprised of a granite bottom, four chrome columns, and a chrome top. USA, 1970s Geometric wall sculpture in brass and chrome by Curtis Jere. Italy, 1970s This large square coffee table by Pace has four removable marble tiles that are set in a chrome base. Italy, 1970s This muscular space age pendant, an example of an Italian 1970s aesthetic, features a chrome frame with twelve large light globes, arranged in two staggered levels. England, 1930s This art deco cart is composed of a circular chrome frame with two mirrored and black glass shelves. USA, 1970′s Cube-shaped club chair by Milo Baughman for Thayer Coggin with vibrant blue vinyl upholstery and brilliant chrome frame. USA, 1970′s This accent light was designed by Paul Evans for the Cityscape series and features his iconic brass and chrome patchwork. USA, 1970′s This chrome floor lamp, in the style of Milo Baughman, features one tall light fixture that is surrounded by three tables of varying heights. Lampshade is included. Each table surfaces measures 12″ in diameter. USA, 1970′s Pair of chrome table lamps by Laurel. USA, 1970s These sleek and comfortable dining chairs by Milo Baughman are in original condition and would make a stylish addition around any table. USA, 1970s These chrome armchairs by Milo Baughman for Thayer Coggin are upholstered in the original red faux fur. Italy, 1970′s The geometric chrome frame adds a unique architectural and sculptural element to this striking armchair.